Scholarly articles can be found in the LibSearch catalogue on the library website or the library's databases. NEVER type more the 1-2 terms in a search box. Go to the Advanced Search page to separate keywords into multiple boxes. Use limiters on the left-hand or right-hand side of the screen to refine results. An international peer reviewed journal that takes a practical approach to this complex subject and relates each topic to the working environment. The international Editorial Board ensures the selection of a wide range of high quality articles of global significance. 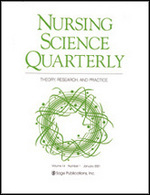 Nursing Science Quarterly (NSQ) is a peer-reviewed quarterly journal publishing original manuscripts focusing on nursing theory development, nursing theory-based practice and quantitative and qualitative research related to existing nursing frameworks, contributed by the leading theorists, researchers and nurse executives. Nursing Philosophy is an international peer reviewed Journal for nurses and healthcare professionals seeking to articulate a more theoretical basis for their practice.Established in response to the emergence of a substantial research interest in philosophy as applied to nursing and health care, the Journal provides a unique forum for discussion of issues at the very foundations of nursing theory and practice. The Scandinavian Journal of Caring Sciences is an international peer-reviewed Journal publishing research that has a patient, family or community focus and which promotes an interdisciplinary team approach. The emphasis is on research that has a patient, family and community focus and which promotes an interdisciplinary team approach.